CENSORED NEWS: Pomo Bighead Ceremony starts the Apache Stronghold Caravan to D.C.
Pomo Bighead Ceremony starts the Apache Stronghold Caravan to D.C.
Open Mercury mining pit filled with water and the Elem Village just on the other side between the pit and the larger Clear Lake that has been poisoned . Photo by Steve Pavey. Hazard signs on fence separating Elem Colony from Mercury mine. Photo by Steve Pavey. Singers and support groups danced hard to the songs, giving power to the warrior who protected the people, keeping the Big Head behind the fire, a distance from the singers. Groups of men, groups of boys, in turn, danced giving strength to the warrior, the shield of the singers and song. The people in the round house rose to dance circling the center space, tossing coins representing their prayers to be carried to the creator during the warrior’s dance. The Bighead came into the Roundhouse, beautifully dressed with feathers and flowers, drawing the attention of those present. The beauty, a disguise of what evils it could bring. The Warrior danced protecting the people keeping the bighead at bay, away from the Songs. The Bighead dance continued Friday and through the night. On Saturday(June 9, 2018), visitors were allowed to enter the Round house and take part. During the day on Friday, Apache Stronghold built a sweat, preparing themselves for the journey ahead. On Saturday, the Stronghold prayed and gave their prayers also to the warrior who held the Bighead behind the fire. The Bighead dance at Elem Colony, (Clearlake Oaks, CA) depicts the reality of America today where corporations are enticing people with products to buy, beautiful things that people want and use, they advertise attracting People, creating wants, but the Warriors are dancing to protect the people, to protect the land, to protect what we have left. This dance came during the time of the Ghost Dance where Native People needed the ancestors to bring back lifeways before Contact. The colonization which came, has grown and now all people are controlled by Colonized thinking of using all of the Earth’s resources. The intention to protect the People from this Greed still holds true today, and even more so, since the Earth’s resources are finite. Protection of what is left for the life of the next generation is a must for all people. For Native Americans, the indigenous to America, they are being challenged in every Reservation because their resources, the lands and water still untouched by America. Corporate America is up to the borders of all protected lands. The Elem Indian Colony of Pomo have 50 acres near Clearlake Oaks, California on the Eastern shore of Clear Lake, the majority of which is a closed off, a fenced in open pit Mercury Mine(Sulphur Bank), which has contaminated the area, the water, the lake and all fish. 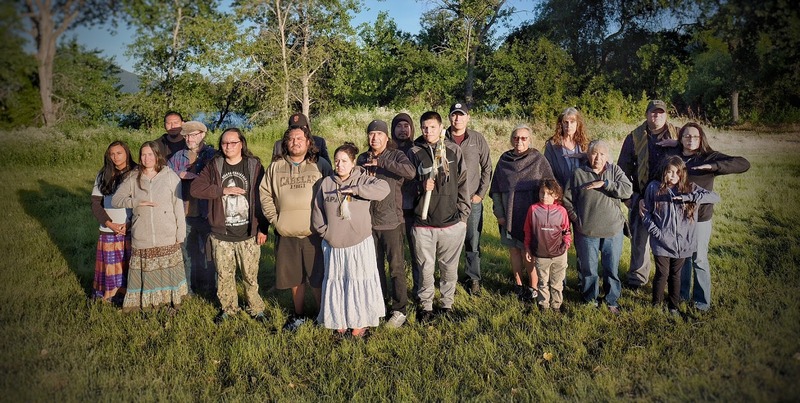 Currently they are attempting to regain ownership of Rattlesnake Island near their reservation, where they had held ceremonies for centuries. The mercury mine that contaminates the reservation of the Elem colony was explored in 1887 by Sulfur Bank Quick silver mining company which went bankrupt after a decade of being the highest producing mine in California The mine closed in 1883 leaving behind two million cubic yards of mine waste and tailings that contaminate Clear Lake, source of water for 4,700+ people. The EPA has focused on mining activity at sulfur bank as a source of mercury contamination of Clearlake. In the middle of all the contamination, the hope of a new generation is stepping up, coming forward. Not staying silent. Reclaiming their religious ways and proud to be indigenous. The prayers, the songs, the strength of the community has lived on despite the injustices close by and the exploitation of the land for mercury. Today, there are no visible signs saying the Lake is hazardous until you turn toward Elem. On Sunday morning, after blessings from Pomo, the Apache Stronghold began their caravan to the Poor Peoples Campaign to meet in Washington DC on June 23rd. The caravan started on the Western coast of America, to bring forth the issues facing Americans, and issues to be brought forth on June 23 in Washington DC. Wendsler Nosie Sr, Apache Stronghold, stated regarding the Caravan to DC, “I’m excited about the #PoorPeoplesCampaign because it is educating America about the first chapter of its history and it is the chapter that will tell the story of this country.” Elem colony in California is the starting point. Beginning the Stronghold caravan to Washington DC from Clearlake Oaks, from the Elem colony, is just one example of the many Nations that have been exploited by corporations and have contaminated the land and the water. 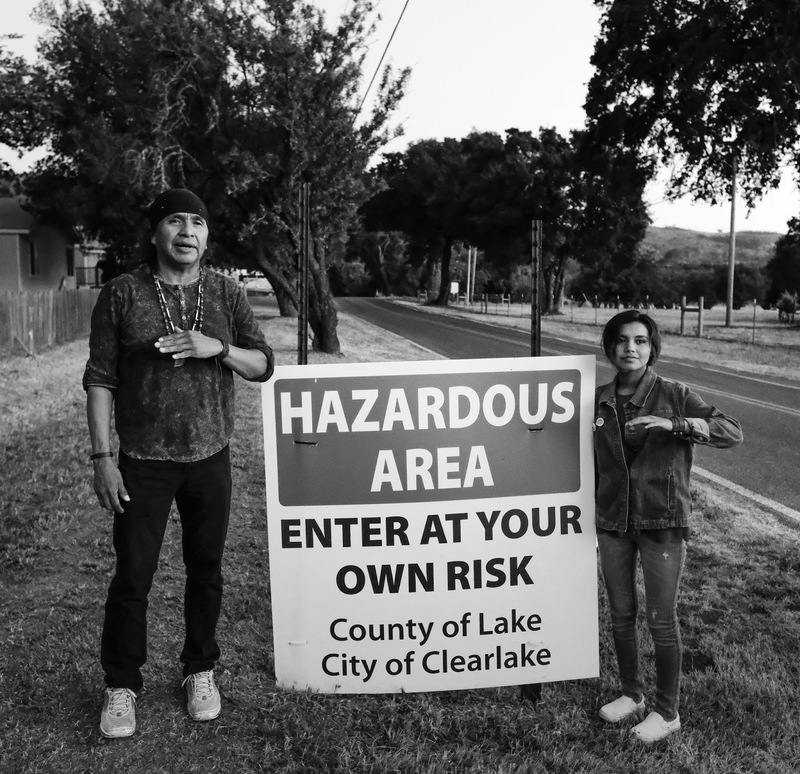 Clearlake Oaks Elem colony is part of the first chapter of America, the movement of people away from traditional sacred sites and land, so that they (Businesses)can exploit minerals for America. Today, The Pomo people still live there, remaining strong in their culture. EPA is currently completing a Focused Feasibility Study for the terrestrial (on-land) portion of the mine site. This study will update the 2006 Feasibility Study with new information gathered from recent site investigation and compare potential alternatives for cleanup. This report is planned for finalization in early 2018. The information from this study will be used to plan the next cleanup actions at the site. EPA is also conducting a new Human Health Risk Assessment to evaluate the ways that contamination from the Superfund site may pose a risk to the health of community members and users of Clear Lake. EPA plans to complete this assessment in 2018.